C-COM announces 1.2m antenna approved by ViaSat. Ottawa, July 2015: C-COM Satellite Systems Inc., the leading global provider of mobile auto-deploying satellite antenna systems, has announced that its iNetVu® 1.2m Ka-band vehicle mount antenna system has received type approval from ViaSat® Inc. for use on the network that powers the ViaSat Exede® Enterprise service. ViaSat is a provider of broadband and communication technologies and services. The new antenna operates in Ka-band but is field switchable to also operate in Ku-band. The product is designed for use by Broadcasters, Satellite News Gathering, Oil and Gas Exploration and First Responders, as well as for the government and military markets. 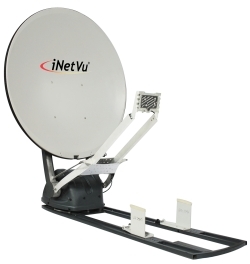 “C-COM’s new and approved antenna model uses the proprietary controller technology which has been field tested and enhanced for over a decade, and is paired with more than 7000 iNetVu® units in the field,” said Leslie Klein, President and CEO of C-COM Satellite Systems Inc. “This sleek and low cost Driveaway system offers an alternative to our customers who insist on a higher diameter cost-effective antenna which might perform better under more adverse weather conditions,” Klein continued. Full production rollout with immediate availability is expected in August 2015.